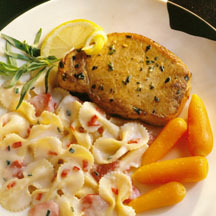 CooksRecipes has quality, kitchen-tested recipes for broiled pork chop dishes that you can count on for successful deliciousness. Move over, filet mignon! 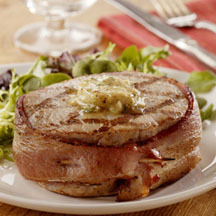 Topped with garlic-mustard butter, these mighty bacon-wrapped chops have the taste territory covered! 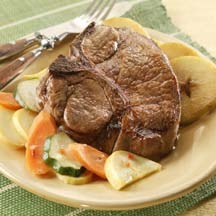 Simply broiled pork chops accompany sautéed apples and vegetables for a simple but satisfying supper. These chops have a simple, garlicky lemon and tarragon marinade that is quite simply—just wonderful.